I just added several new Blythe Beanies to the shop this afternoon. All new designs, and just a small peak of what I have been working on lately! What are you thoughts? Should I make more? Should this be something I bring to BlytheCon? Do you want me to stop asking questions? I found out this past weekend that I will be a vendor at BlytheCon Seattle! It’s August 2nd, 2014 at the Seattle Center’s Fisher Pavilion. I am excited, it will be my first time selling the eye chips in person, plus I have plans for some new products. My little sister Cori is most likely coming with me, and it will be our first time visit the Pacific Northwest. So if theres anything you think we should check out in Seattle, and possibly Portland, let me know!!! Also if you will be attending, I’d love to know about that too. This past weekend Molly hosted an adorable Blythe Ice Cream Social! It was a nice little get together of girls who collect Blythe or just like them (and should collect them!). There were loads of sweets and ice cream toppings plus a bunch of different ice creams and custards. My lactose intolerant self even indulged in some. She also provided a bunch of sculpey and cute faux food craft books so we could make little sweets for our dolls! I kinda viewed the day as a break from making teeny things, so I didn’t make much. But it was neat seeing everyone else working away! Like look at that mini lipstick and donuts Lindsay made?! super cute! Heidi also brought some of her doll customizing tools so I was able to see how a few of those processes were done. If you look above you can see some of the hair she plans on adding to one of her girls scalps. It didn’t look too hard, but seriously tedious. I really want a girl with black and gray hair, so I THINK I may try. I think it’s neat how all of our dolls are basically from the same mold, but each of them has such different looking personalities! The top one above is one of mine, the second one down is one of Heidi’s and the last one is one of Molly’s. Anyway, back to the get together real quick! As always it was great seeing everyone. It’s nice to everyone and have a some time away from CT. Some months I REALLY need it! Thank you Molly!! 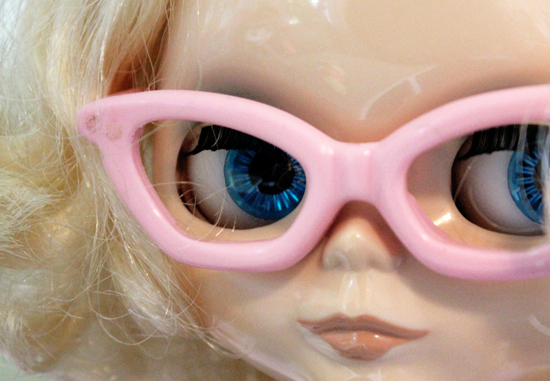 I updated even more Blythe Eye Chips in the shop over the weekend. I have been meaning to o this for awhile, but cloudy and sometimes dark weather kept me from getting color correct photos. I found some time friday afternoon (minutes before a ridiculous hail store) to get in a few photos, which I was very happy with. I actually enjoy photographing these now, before it was kinda hard. You can find all of the new eyes in the shop HERE.